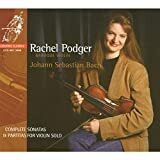 Rachel Podger's Complete Sonatas and Partitas for Solo Violin, BWV 1001-1006, are another true delight. "Authentic baroque" again, with Mme. Podger who is a professor of Baroque violin in London and Bremen. Now issued conveniently as a two-disc set (for the price of one) by Channel Classics, this is a truly outstanding effort, and showered with critical acclaim as it was (like Saul, as mentioned in my post on July 5), it isn't difficult to recommend this recording of some of Bach's finest works. Rachel Podger is convincing, stellar even, and always interesting in her tackling of these seminal works, which continue to cast their shadow over any composer writing for solo violin. With brio and technical prowess, she gets the most out of the rhythm, the jagged corners, the arresting double stops, and all the other elements that make these six works so great. In her energy and tension, she rivals my favorite account of these works, Nathan Milstein's 1975 recording for DG... and Milstein was by no means playing on a Baroque violin or going for authenticity in style. Thick and positively grating at times, Rachel Podger (or rather, her tone!) is energetic in a way one would not assume to find in a "historically informed" performance, and the lack of a creamy vibrato and a strong rubato does not affect the enjoyability one bit. For modern and period recordings, this goes straight to the top of my list and meets all-time favorites Nathan Milstein, and leaves well behind uneventful Arthur Grumiaux,the mellifluous Shlomo Mintz, sweetly melodic Itzhak Perlman, and willful Jascha Heifetz.